A couple of people have asked me how to play existing SID files in FMX. 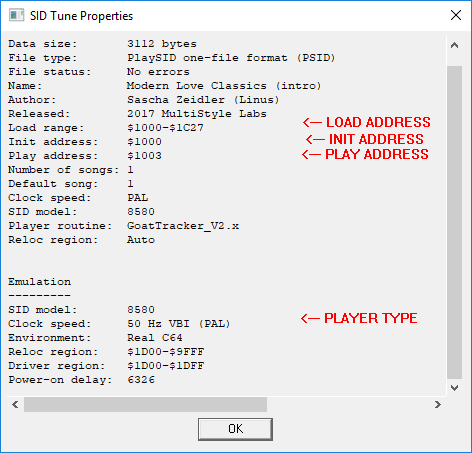 (my FM cart music driver) I've written a tutorial below to get basic conversions going, it looks like a lot of steps but once you've set it up once you hardly need to change it afterwards. Maybe in the future I'll dig into the advanced features which can help with better conversions and making instruments, though in the meantime I suggest reading the docs that come with it. While you need to download an assembler to use it, FMX is designed so you only need to change tables to get results out of it. You don't need to do any coding! A copy of the DASM assembler. Any version should do, here's a link to a Windows version from Lasse's page. A Sid player so we can get some info. 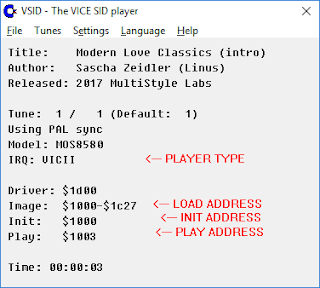 Personally I use VSID that comes with the Vice emulator , but most of them have an info page in there somewhere. Another example is Sidplay/w for Windows. Unpack FMX (with it's sub-folders) into a folder on your computer. Move into the src sub-folder and unpack DASM into here. We'll be doing our main work in this src folder from now on. 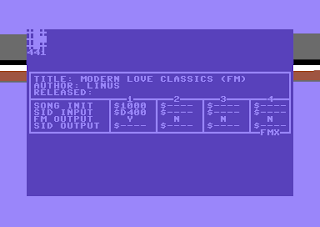 Now we want to set up FMX so it's ready to play a single SID tune with an optimal setup. 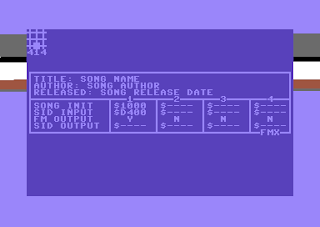 Move into the configs sub-folder and then into the one called config-1song_only_fm, select & copy all the files in here. Move back into the src folder and paste the files we just copied here. It'll overwrite some existing files but this is normal. Now those first two steps are out of the way we don't need to revisit them again in future. Unless you have some sid tunes already the best place to find them is in the High Voltage SIDS collection. If you're looking for particular tracks there's a search engine for it at the Exotica game music site. So, we have some songs and now we need to load them into the Sidplayer to find some info on them. What we're looking for is the player's info window. 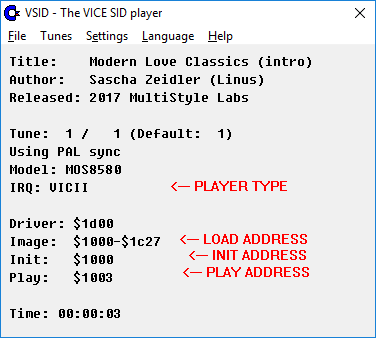 I've put up screenshots below showing the info we need in Sidplay/w and VSID. VSID has it on the main display whereas Sidplay/w shows it when you go to File/Properties. The Player Type has to be a 'vblank' type to work with FMX. This is listed variously as VICII, VBI or simply VBLANK. 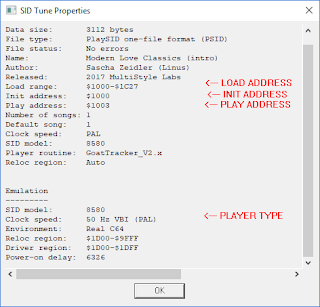 The Load Address is where in memory the music is stored. By default FMX has the space between $1000-$6fff or $a100-$cfff free, so make sure it fits between one of those two areas. The Init Address is the piece of code called when the song starts to play. This usually sets up the music player and resets it to the beginning. The Play Address is called every time the screen refreshes to keep the music playing. 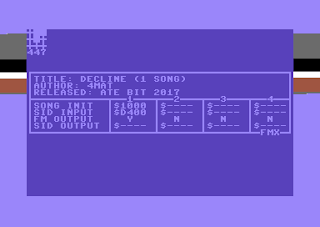 Yes, now it's time to try playing back the SID file on your FM chip. Copy your SID file into the src folder where we've been working, I'm using the track 'Modern Loves Classics Intro' from the screenshots in this example. Now we need to open up the file fmx-song.asm to put in the info we've collected. Any text editor will do, even notepad. This may look daunting if you don't code but don't worry, we're only changing some names and numbers around. As you can see the Init and Play are split into two tables each, the first two digits of the address go in the top table and the last two go in the one below. So, if your init address is $4000, you put $40 in the top one and $00 in the bottom one. (likewise with play, if it's $4003 you put $40 in the top one and $03 in the bottom) We can ignore all the extra columns in these tables as they're for multi-sid songs. Finally if you want to play a different sub-tune to the default look for the player_song label as in the screenshot below, and change the first value to your new song name. FMX counts songs from zero, most Sidplayer displays start from one so you'll need to subtract one from your value. Extra features, changing text etc.